Granite is one of the hardest rocks on the planet, formed deep underground from compressed molten rock. Rocks are judged on an MOH scale, 1 being the softest (talc) and 10 being the strongest (diamond). Granite ranges between 6 and 8 on the MOH scale. Granite is hard, heat-resistant, and can take a number of beatings without chipping, denting, or scratching. 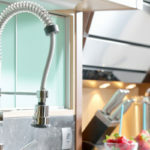 Think about all of the wear and tear your kitchen counter tops take each day, from hot pans being placed directly on top, to knives accidently slamming against the surface. While most people know that granite countertops are incredibly durable, did you know that they also help protect against the formation of mildew and mold? 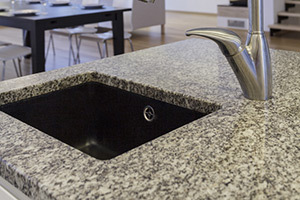 Granite actually helps fight against bacteria. 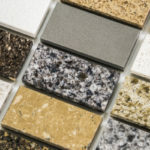 Plus, granite counters can be surprisingly affordable, adding great value to your kitchen remodel. 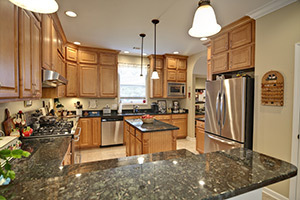 No wonder granite countertops remain one of the most popular selections for high-end kitchens. Here we provide answers to frequently asked questions concerning granite. Granite starts off deep in earth’s crust, slowly forming from magma lava. It is the most common igneous rock found beneath earth’s surface and can be used to construct so many different things, which is why so many can recognize it. It’s a process to extract granite from the ground, one that must be done carefully so as not to impact the surrounding earth. Sedimentary rock forms all around granite keeping it safe from damage; in order to extract granite this sedimentary rock must be blown away. Deep holes (about 25 feet) are drilled on all sides of the granite before explosive ropes are attached to blow apart the surrounding rocks. Usually granite is extracted in large chunks, up to 100 feet long. Before being transported elsewhere, this larger block of granite must be broken down into smaller, more manageable pieces. Once granite is around 4-5 feet wide and 7-9 feet long, it can be processed for use in your home using a number of mechanisms. Machines are used to prep the granite so that it appears nice and polished. If your kitchen remodel requires custom installation, other tools are used to perfectly shape the countertops. Why Are Granite Countertops So Unique? Do You Need a Sealant on Your Granite Countertops? Remember, before sealing your granite countertops you will need to clean them really good. Otherwise, stains can get trapped beneath the surface and become permanent. What Is The Average Countertop Height For Kitchens? We do so many tasks while sitting down, but cooking is almost never one of them. You stand over your countertops for a good amount of time, preparing meals, baking cakes, or even putting away the groceries. 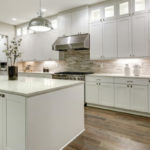 The fact that we spend so much time bent over our countertops has created a lot of controversy surrounding how tall the average counters should be. The average kitchen counter is around 3 feet tall; this typically makes for the most functional height. When it comes to designing a kitchen to fit your needs exactly, you can play around with height measurements to better suit your own size. If you are not the average height, either shorter or taller, you may feel more comfortable working at a different height countertop. If you are shorter than average, you may want to consider counters that are around 32 inches tall, or just below the average 3 foot mark. If you are taller than average, cabinets between 38” and 39” inches are often ideal. If you are in a wheelchair, kitchen counters are recommended to be around 31”-34” inches tall, as the standard wheelchair is 29” inches tall. If you plan to adorn your center island with bar stools, you may want to consider a different height for your island countertops. Although, if you also plan to do cooking here, you want to make sure that the height differentiation does not interfere with your comfort. The average height for island counter tops is around “42 inches with barstools. Without bar stools, 36” inches remains a popular height choice for island counters. In order to keep your granite countertops looking nice and practically lasting forever, simply keep up with regular cleaning and any necessary maintenance. Some granite is great at hiding crumbs and other debris. This is why it’s important to make a habit of wiping down your counters daily no matter what. You can simply use a moist microfiber rag to do so. About once a week you will also want to use a cleaner with a neutral pH specially formulated for granite. You want to avoid chemicals and harsh cleaning products, which can start to damage your granite over time. Your granite countertops can last a lifetime with proper care. Keep a close eye on your granite so that you can react to any signs of damage. Little signs can be very telling, for instance if you notice that water no longer beads up on your counters, you might need to have your granite re-sealed. You also want to check for any cracks or seam shifting. 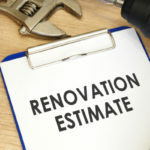 At the first sign of a problem contact a professional so that it can be resolved before it expands. Although your granite is heat proof, you can help extend its life and prevent any potential damage by using mats, towels or potholders beneath extremely hot dishes. Look for cleaners made especially for granite and other stones. Your granite countertops are very strong, but they can still crack if struck with a lot of force. Don’t push your luck and beware when using tools such as a heavy-duty meat cleaver, which can cause your granite to crack if it is hit hard enough with one. While vinegar is a great natural cleaner, don’t use it on your granite counters. You also want to avoid bleach and any cleaners that are heavy with alkaline. At Tops Kitchen Cabinet we offer granite countertops at wholesale prices so that everyone can afford the luxury and durability of granite.